Piston and barrel kits for both Type 1 and Type 4 engine, parts and accessories for street and racing applications. When you just need new cylinders (barrels) you can reply on RPR. Forged Racing piston & cylinder kits - For the Type 1, we stock both AA and JE forged Piston and Liner kits. These kits include forged pistons, rings, tool steel pins, clips and precision cast iron cylinders. Sizes range from 92mm to 101.6mm all for strokes 78 to 86mm. AA Forged pistons are made from 2618 Aluminum Forgings. The JE pistons are also made from 2618 using their 3614F Forging that is set up to make Valve pockets if needed. 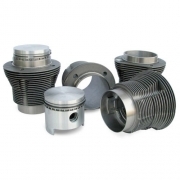 Forged Racing piston & cylinder kits - For the Type 4, we stock JE forged Piston with AA Liner kits. These kits include forged pistons, rings, tool steel pins, clips and precision cast iron cylinders. Sizes range from 103 - 105mm for strokes 78 to 86mm. The JE pistons are made from 2618 using their 3614F Forging that is set up to make Valve pockets if needed. When all you need are new pistons, you can reply on RPR. Standard piston and cylinder kits for all Type 1 engines - High quality cylinders cast from proprietary tooling are carefully inspected then honed to exacting tolerances in a cross hatch pattern to promote quick ring seating. The hypereutectic pistons are cast from a special high silicon content alloy to provide high strength, better cooling, less scuffing as well as resistance to excessive expansion at high temperatures. All of the “stroker P&L” pistons are of the slipper skirt design. The pistons are graphite coated (87mm & larger) and carefully inspected for any flaws or defects. They are then arranged and sorted by size and weight. Rings are installed setting the proper end gap and the pins are fitted to each piston. The Pistons and liners go through a rigorous quality control series of tests and are balanced within plus or minus 1 gram of each other. It is also important to note, that I have both naturally aspirated and turbo charged engines producing over 180 HP with these kits. Standard piston and cylinder kits for all Type 4 engines - High quality cylinders cast from proprietary tooling are carefully inspected then honed to exacting tolerances in a cross hatch pattern to promote quick ring seating.